Bloomsbury USA Childrens, 9781619633902, 40pp. Wiggly, giggly preschoolers will love the action in this picture book with its catchy sequence of movements and directions -- hop up, bend down, spin round, jump over -- that are endlessly fun! A young boy and his energetic puppy take a walk in their neighborhood, where they encounter and interact with lots of friends along the way! 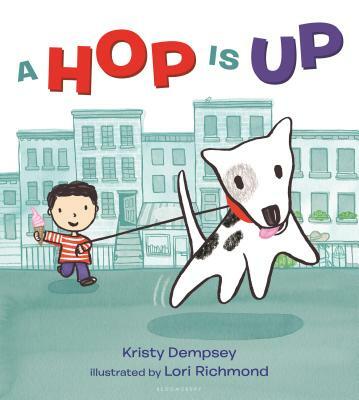 Dempsey's poetic and playful text is brought to life by Richmond's rich, kid-friendly illustrations. It all comes together for an inspired story that will have everyone on their feet! Kristy Dempsey is the author of Mini Racer, Surfer Chick, A Dance Like Starlight, and Me With You. She works as a school librarian at an international school and lives in Brazil with her family. Lori Richmond the author and illustrator of the forthcoming Pax and Pigeon from Paula Wiseman Books (Spring 2017). As an artist, she has worked with brands and companies like Adobe, Apartment Therapy, Pottery Barn Kids, The Knot, and The Bump. She lives with her family in Brooklyn, NY.